Have you ever spent time thinking about specific places within your organization where the actual value is created every day? We spend lots of time budgeting, strategizing, implementing new processes that are meant to improve our operations, but are we putting them in the right place? If someone came to you and asked a simple question  What is the single most laser-focused point of value creation inside your organization?  what would you say? In other words, what is the success of your business rooted in? We are destined to find businesses that believe that finance is the key to this equation (financial services), or sales (insurance), or the operations teams (in case of the manufacturing industry). But if the views on this topic differ so drastically, can we find a common denominator? I believe we can. You see, whether you are an engineer, a marketer, a sales executive or a CEO  the value that you generate is not born out of your interaction with your product, your brand, your CRM system or your budgeting spreadsheet. The value that you generate is born and evolved precisely in the conversation and in the relationship between you and your customer. Why, you might ask? Well, we all agree that transactions help businesses thrive. But its connections and relationships that lead to transactions, not vice versa. And since the life of any organization is heavily based on relationships – relationships follow the rules of life  they either grow or die. There is no middle ground. The only two outcomes of your relationship with any one of your customers are that it will intensify and improve or diminish and disappear. Your choice  either you can maintain an ongoing conversation with your customers and use your agility to respond in business-relevant ways, or go mute (in more than one meaning of the word). The decision is yours. Once upon a time anyone could listen and talk to the masses  all you needed was several million dollars, a team of editors and writers, a printing press capable of shooting out a dozen copies per second and a distribution network that would put your publication in stores across countries. The result was that the information came down  we didnt talk among ourselves, we were only talked to, by select few. The world has changed, by removing all of the requirements above. The army and the cash are now just extra ingredients in the recipe to success. All you need is Twitter. The brilliance of 140 characters or less is now being shared by more than 100 million users. Say anything you want, and you automatically BCC the World. And more and more of us are choosing to say things that are directly relevant to businesses and to the relationships that they foster with their customers. 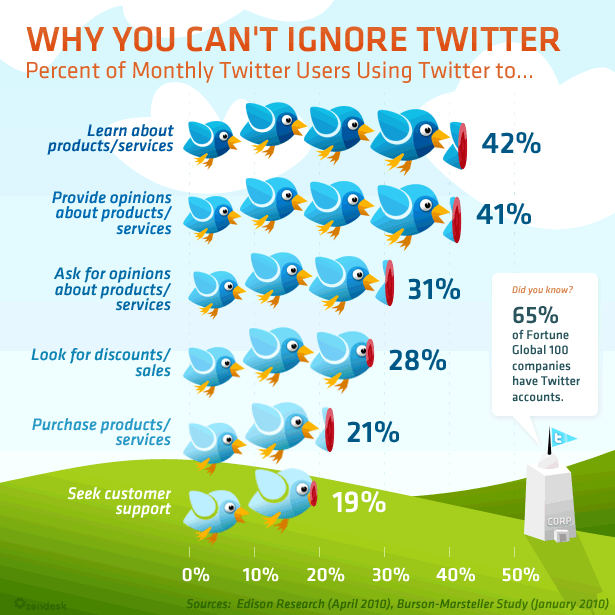 If you want to learn about products, you are among the 42% of all Twitter users. If you provide opinions about brands and services, you fit in yet another 41%. If you are looking to buy an ERP, or a movie ticket for that matter, you are among 21% of us all! The takeaway is clear  the conversation is on – and whether or not you as a business take an active part in it, is up to you. Businesses are recognizing this trend. According to Gartner, enterprises themselves are already positioning Twitter as a standard one to many communication tool in more than 80% of all cases. And these companies are quickly realizing one thing – as much as they want to nurture every relationship, advances in technology have given them access to more relationships and less time to deepen them; more opinions and no tool to capture them; more feedback and no deviceful way to act! Those who see the value of having social conversations with clients also find that its impossible to keep up without a tool that can help manage these conversations and make them actionable. Go ahead – launch your Twitter client now. Do you see a tweet that your business should act on? Search for your companys name, your product and services. You will undoubtedly see a sea of feedback. What would you do next? Should you email it to someone in your organization and then keep following up on the status or progress? Should you forward it as an email to a group within your company, only to find out that they were not the right group of people to act on it? Well, the wait is over. The twickets from Zendesk are here. Check it out, and the conversation is yours!